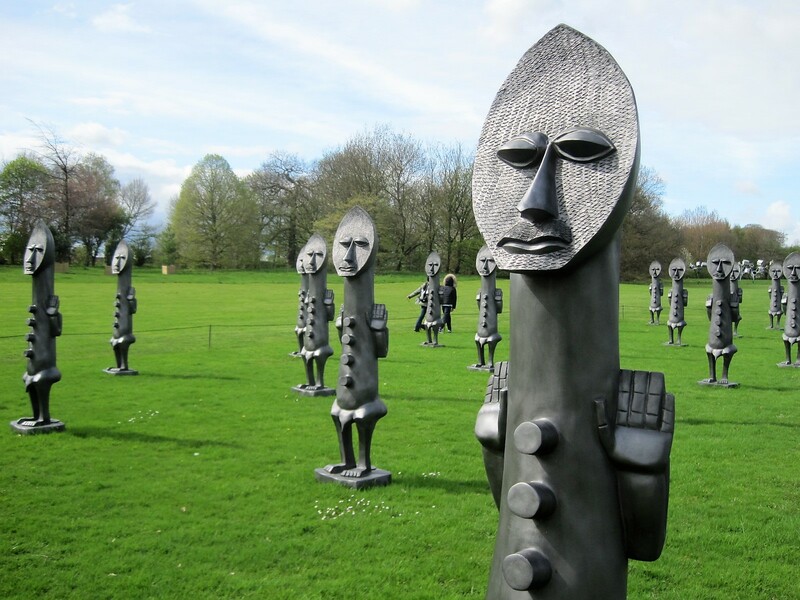 Not sure that I’d want to meet this tribe on a dark night, but on a semi-sunny afternoon at Yorkshire Sculpture Park they seemed harmless enough. I had hoped to find some Spring colour and a whole heap of rhododendrons, but it didn’t look too promising on my arrival. The sheep were oblivious, despite the antics of a small boy. I was happy to find that many of the sculptures had been replaced since my previous visit, so off we went, on a mission of discovery. Over the bridge and upwards, a carpet of bluebells cheering us on. The ‘rather cool’ tree sculptures, nourished by decaying leaves, had obviously been there for some time. Up on the tops it was cool and breezy, but you could see for miles, rapeseed fields lighting the horizon. And then it was down to the Longside Gallery, and a coffee stop. No, I’m sure you don’t want to see a photo of my chocolate fudge brownie, but I’d earned it. The small boy was worried at the appearance of a shaggy Highland Cattle beastie, directly in our path to the gazing head. With scarcely a glance in our direction, it lumbered into the mud and better grazing. The head, eyes closed, I found very beautiful. The lake was huge, families strolling peacefully in pursuit of culture. I could have wished for more information on the sculptures, but it wasn’t until our walk was over that my husband offered the leaflet he’d picked up. What was that, lurking on the field? Unarmed warriors, it appeared to me. I was sure there was meaning. Fortunately the YSP website explains all. British-Trinidadian sculptor, Zak Ové, is responsible for Black and Blue : The Invisible Men and the Masque of Blackness. He seeks to “reignite and reinterpret lost culture using new-world materials, whilst paying tribute to both spiritual and artistic African identity”. In this work, the sculptor uses graphite to explore what he describes as “future world black”. Ai Weiwei’ s Circle of Animals/Zodiac Heads has been touring the world since May 2010. The 12 bronze heads have a historical reference, but Weiwei intends them to be playful and accessible. I ceased my perusing to head for the Camelia House. Their beauty was easy to understand. I kept looking for that telltale splurge of colour, but green predominated. Returning to the entrance, I was sorry to see that the reflective silver sphere I loved last time was being replaced. But there’s often light at the end of the tunnel, and so it proved to be. A dazzling display of soft pink, rhododendron wonder. Exactly what I was looking for. Have you been following Cathy’s extraordinary new venture at Wander.essence? More energy, enthusiasm, attention to detail and pure determination to get it right you will not find in the world of travel blogs. I have Cathy’s permission to include my walk on her Photography Invitation. I hope she likes it. Do join her on one of her many adventures! It’s a Bank Holiday here in the UK, so hopefully you’ll have time to read and share my walks this week. Many thanks to all of you for taking part, and for your continued support. 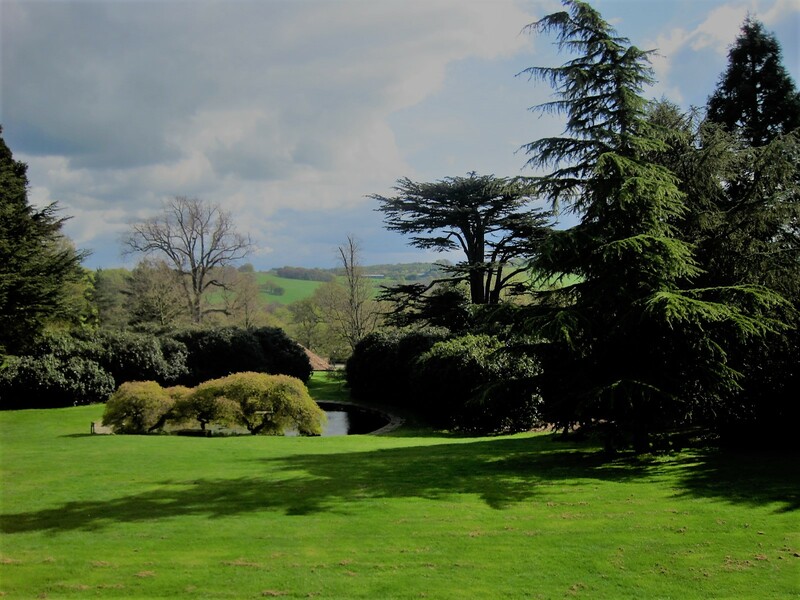 Join me any time- the details are on my Jo’s Monday walk page. If you’ve never been there, be guided by Andrew’s wonderful descriptions. Or even if you have! Another glorious morning here! I would tap dance my way into the garden, but it doesn’t work with carpets. Have a wonderful week, all! Much prefer the tree sculptures and the giant heads to the alien army 🙂 The heads remind me of the Bayon faces of Cambodia. Beautiful blossoms in a gorgeous light but of course the sheep family? My favorite. Always good to accompany you, Jo. I have to admit, me and Mick shook our heads at some of it, but somethings do speak to you, don’t they? I really loved the Head, gazing out on the lake. I thought you might have a Bank Hol walk. Wasn’t the weather glorious? 🙂 🙂 Be over in a jiff. As always, a delightful walk. You know I love anything involving public art, but the flowers are a welcome sign of spring! It came late here this year, and I am just drinking it in. I’ve been on a blogging break because of work demands, but I’m back now. My first post is for your next Monday walk: https://findingnyc.com/2018/05/12/janes-walk/. That’s great, thanks Susan. I don’t have my laptop on at the moment but I’ll come over soon.